Fordhook Giant (55 days) Deep green leaves, heavy crumpled. White veined and broad white stems, very heat resistant. Pink Passion (55 days) Deep green leaves with hot pink ribs and veins. Adds color to salads. Rainbow (60 days) Multi-colored leaves with red, pink, orange or yellow ribs. 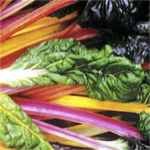 Red Rhubarb (Ruby Red) Swiss Chard; (60 days) Dark crimson red stalks and veins with dark green leaves.